If you're going no further than the sofa - and even if you are - here are some tips on what's worth watching on the box between Friday and Sunday . . . This feature-length documentary tells the story of how David Robert Jones became David Bowie, how Bowie became Ziggy Stardust and how Ziggy became immortal - changing the musical landscape as easily as he adopted another new persona. With remarkable, previously unheard audio recordings, unseen archive and unpublished documents alongside exclusive interviews with David’s family, girlfriends, lifelong friends and early collaborators, this film shows how his experiences in the 1960s created a blueprint for his entire career. 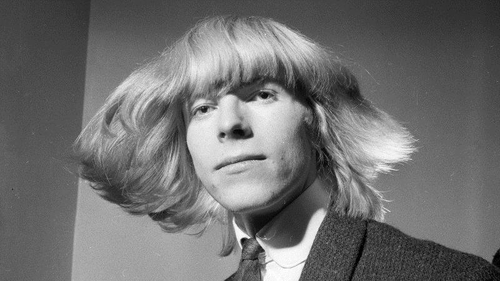 Starting in 1966, when he changed his surname to Bowie, the film traces his interest in everything from Holst to Bill and Ben, the Flowerpot Men, and Anthony Newley to Tibetan Buddhism. Highlights include a deconstruction - through the eight-track masters - of Bowie classics including Space Oddity, The Man Who Sold The World and the song he wanted to forget, The Laughing Gnome. There are previously unheard demos, never-before-seen footage of his journey through Siberia in 1973 and extraordinary Ziggy footage, believed to be lost forever. Love is in the air as The Late Late Show once again brings singletons from all over Ireland to the RTÉ studios for a love-filled evening of fun a few days ahead of St Valentine's Day. Ryan Tubridy says: "We want to hear from anyone who is looking for a little romance in their lives. In this age of dating apps and social media, we’re going back to basics and want to spark some love – on live TV! "As always, the show will be great fun, and you never know, there could be someone for everyone in the audience." Ireland’s best-known architect showcases some of the world’s most amazing homes. From sunny Sydney to London, stylish Melbourne to northern Sweden, Dermot Bannon explores how people live around the globe. In episode one, Dermot visits the award winning Cabbage Tree House, a stunning home embedded in the hillside of the suburbs of Bayview in Sydney’s Northern Beaches. Designed by Peter Stutchbury, the cave-like house, with its outdoor bath and breath taking views, is home to Jan and Graeme Page. Joanna Lumley takes centre stage at London’s Royal Albert Hall to host the celebrated British Luvvies' love-in. The Favourite is nominated in 12 categories, while Bohemian Rhapsody, First Man, Roma and A Star Is Born all received seven nominations. Vice has six, BlacKkKlansman has five, while Cold War and Green Book have four each. Can You Ever Forgive Me? , Mary Poppins Returns, Mary Queen Of Scots and Stan & Ollie have three nominations each. Years before they brokered one of the biggest deals in music history - the 2015 sale of Beats Electronics to Apple for $3 billion - Dr Dre and Jimmy Iovine navigated very different environments towards destinies that would, ultimately and improbably, bring them together. In this first episode of four, their stories are explored. Dre’s began in Compton, where his fascination with dance music, DJ innovations and sound eventually led him to being a vital part of gangsta-rappers NWA. A native of Brooklyn, Jimmy Iovine gravitated to music, with a determination to avoid the family business of being a longshoreman. Through a combination of hard work and old-fashioned luck, he connected with artists such as John Lennon, Patti Smith and Bruce Springsteen. In the second episode, which follows at 10.45pm, Iovine’s reputation as a fearless, talented and indefatigable producer is explored, and how he reached the West Coast, following a successful collaboration with Patti Smith. On 12 September 2015, a 30-ton humpback whale breached and landed on Tom Mustill and his friend Charlotte Kinloch as they paddled a sea kayak in Monterey Bay, California. Incredibly, both survived the incident, but the near-death experience haunted documentary maker Tom and here he meets those who have survived similar encounters and the experts who know the whales best. Presented by Mel Giedroyc and Måns Zelmerlöw, this live broadcast comes from MediaCity UK in Salford. The six acts involved will compete for the honour of representing the United Kingdom at the Grand Final of the Eurovision Song Contest 2019 in the Israeli capital, Tel Aviv. Following an explosive first season, viewers once again get an intimate look at the ups and downs of starting or expanding a plural marriage. Since their failed attempts at courtship last season, Dimitri and Ashley have started dating Vanessa, a vivacious woman from Seattle. By all accounts, Vanessa seems like the sister wife of their dreams. In this final episode the remaining four men and four women go into the most psychologically demanding test so far: resistance to interrogation. A team of professional interrogators subject the recruits to stress positions, white noise and relentless grilling. Can any of the recruits prove that they are mentally and physically strong enough to pass this process? The Australians find out whether they will be prosecuted, Ismail seeks revenge and the truth of what really happened is finally revealed. The truth puts one life in danger as Ismail, blinded by grief, seeks retribution. In this special edition of the topical culture programme, Mary Beard talks to the Carnegie Prize-winning and globally bestselling author of the His Dark Materials trilogy of fantasy novels, Philip Pullman. Here's a long form documentary series of high profile, in-depth stories about music's impact on society, as told by critically acclaimed directors, with each episode revealing surprising insight beyond the expected or commonly known. First up, Sam Cooke was the most influential black musician of the Civil Rights Movement and advocated for the rights of black musicians, frustrating the white establishment. An investigation into the circumstances and controversy surrounding his shooting death include theories that he had been robbed and 'trick-rolled' by a woman, later revealed to be a prostitute. But many believe in a larger societal set up. One of Pixar's finest films - and that's quite a crowded arena - this 2009 animated dramedy centres on an elderly widower named Carl Fredricksen (voiced by the legendary Ed Asner) and an earnest boy named Russell (Jordan Nagai). By tying thousands of balloons to his house, Carl sets out to fulfil his dream to see the wilds of South America and complete a promise made to his late wife, Ellie. Not to be confused with the 2011 cinema version of the classic Charlotte Brontë novel starring Mia Wasikowska and Michael Fassbender, this is a 1943 adaptation featuring Joan Fontaine in the lead role, while an outstanding Orson Welles plays Edward Rochester. A terrible time for a really good film, so set the red button if you haven't seen this one before, a drama based on the book of the same name by Zoë Heller. A veteran school teacher (Judi Dench) befriends a younger art teacher (Cate Blanchette), who is having an affair with one of her 15-year-old students. However, her intentions with this new 'friend' also go well beyond platonic friendship. It's switch-up week on Dancing with the Stars and following a public vote celebrities will dance with their new pro-dancer for one show. Will the new pairings be a happy one? And how will the switch up affect their place in the show? As usual, Jennifer Zamparelli and Nicky Byrne are on hosting duties. All four seasons of David McSavage's hilarious and often close-to-the-bone sketch show. My personal favourite character is the obnoxious barman, but there's something here for anyone and everyone.